The VC investor recognizes the value of storage, questions the technologies being applied, and alienates most of the industry. I'd wager that investor Vinod Khosla is not going to be invited back to speak at the Energy Storage Association. Khosla usually says something controversial, contrarian and clever. It might not always go down easy with the audience -- and it didn't on Tuesday night. Khosla spoke to about 300 energy storage experts at the annual Energy Storage Association (ESA) meeting. He acknowledged the critical importance of energy storage, showed his knowledge of the sector, and had the crowd eating out of his hand. He then proceeded to dismiss many of the technologies that those at the industry gathering were working on as "toys" because of their inability to scale to truly solve grid-level problems. He also predicted that A123, the lithium-ion battery manufacturer would not be around in ten years. That was less satisfying for the audience (which included A123). The incoming and outgoing chairmen of the ESA were somewhat aghast at the comments, although I'm sure Khosla would say them again. He's looked at the smart grid and considers it "more smart hype than smart grid." We've covered his views on the smart grid, which include the statement that "automated meter reading is not smart grid." Khosla also has a common refrain that most forecasts and analysts are "as good as dart-throwing monkeys." Concerning storage, Khosla said, "When I look at storage I think of the competition as peaker plants. You can bring on energy from peaker plants or bring on storage." Khosla saw this as a positive in that, "You know exactly what your competition is." "What is changing with rooftop solar," he continued, is that "We haven't dealt with lots and lots of generators in a serious way," Khosla then proceeded to show the same two slides on wind and solar variability already shown at this event a dozen times. Those slides can be found here if you're interested. Bottom line -- solar and wind are intermittent. "The problem in the grid is managing uncertainty." The drivers of uncertainty, he went on to list, were increased amount of renewables, increased capital risks of fast-moving technology, and increased security requirements. One can increase certainty by aggregating supply over geography, over time (that's what storage is) or by using information technology, according to the investor. "Storage is a key element of certainty," said Khosla, telling the storage industry audience, "Your task and role is far more important than people realize." Smart meters, HANs, and thermostats -- or storage. 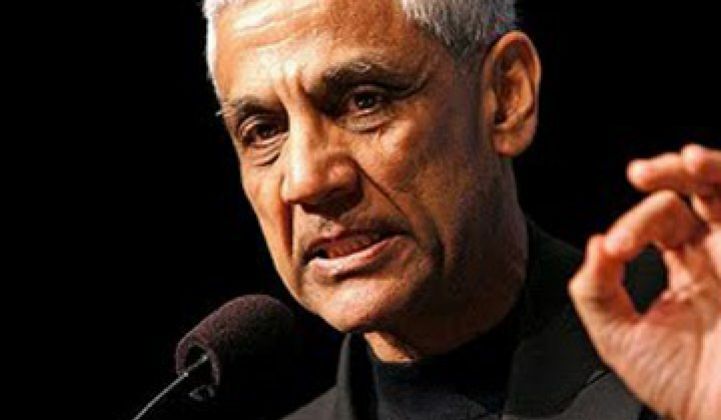 Khosla returned to his refrain about the need for better power electronics. In the past, he's said, "The grid really equals smart power electronics. It's not even about the networks." He added, "We need a whole new class of devices and systems. A 50-year-old transformer made of copper wire wound around a ferrite core can't respond to a signal, so we can't control it," adding, "If we invest in new power electronics devices, things will change radically. The design of existing systems will change based on these new components." His advice to entrepreneurs: "We have to focus on power electronics." He sees smart power electronics as a way of "decoupling the rigid grid" and getting us away from a "hard-coupled grid" with energy storage as a "great shock absorber" so that a tree falling in Ohio doesn't knock out the power grid in New York. While laptops and consumer electronics follow Moore's Law of performance doubling every 18 months, he saw the grid under "Westinghouse's Law" with big change occurring every 50 to 70 years. He cited transformers as an example of the need for "fundamental new power electronics devices." "The problem in power electronics is that no one has invented a new device," according to Khosla. There's been "a little work in IGBTs" but "We need a new class of powers devices and systems." He saw "no reason to be using copper winding" in a transformer, a technology from the 1800s with few changes over the last century save for some cooling and changes in materials. "We need new gallium nitride (GaN) devices and transistors and we will bypass Westinghouse's law," according to Khosla. In ten years, we'll see changes in power systems using solid-state transformers that will create an "uncoupled" grid. Energy efficiency vs. conservation or insulation? Load regulation vs. active devices? Command and control vs. resilient networks? As mentioned, Khosla described lithium-ion batteries as "toys that can't be deployed at scale." He said that lithium-ion was "too volatile" and "too expensive." To be economical, energy storage has to be fundamentally safe -- without the necessity to wrap tons of management and safety equipment around it to keep it from exploding or catching fire. He dismissed compressed air energy storage (CAES) and pumped hydro as technologies that can make a business but "do not change the nature of the grid." Khosla sets the bar for storage as round-trip efficiency better than that of lead-acid batteries with costs below $100 per kilowatt-hour. "Diversity is key," said the investor, concluding: "My willingness to fail gives me my ability to succeed."